While ORMMA has been around for a year, primarily in the United States, this week ORMMA finally broadens its coverage to Asia after MobDis announces its support of ORMMA. MobDis, a product of venture capital funded Singapore based start-up 2359 Media Pte Ltd, is leading ORMMA support in Asia and also pledging to educate the Asian community about ORMMA. Mobile Marketing Associate APAC is working with MobDis in this industry adoption. The Co-founder of MobDis, Zhou Wenhan, commented that, "We (MobDis) wanted to adopt ORMMA as it is currently the most popular standard in the industry. The standard is supported by respected organizations like Mobile Marketing Association (MMA) and Interactive Advertising Bureau (IAB) is using ORMMA as the starting point of its own MRAID standard. We are glad that we have achieved ORMMA compliance and will look forward to support MRAID as well." With that, MobDis have released an infographic to explain and educate on the importance on mobile rich media advertising standard. The infographic shows the what, why, when, who and how of ORMMA. This week, an IAB working group started discussing the ORMMA API in depth as part of an initiative to define an IAB standard. The name for IAB’s standardized API is MRAID. Many of the ORMMA member companies are also IAB members and welcome this activity. It came to my attention that there is plenty of confusion about different names for this mobile in-app standardization initiative. ORMMA is the name of the consortium that defined the API and also provides a reference implementation of it. MRAID is the IAB naming of the API. The IAB, who has defined standards such as VAST and VPAID, is now looking at MRAID as an API to improve interoperability for ad serving in mobile applications. MRAID stands for Mobile Rich media Ad Interface Definition. This MRAID API is based initially on the ORMMA definition and ORMMA.org is committed to remaining compatible with the MRAID specification. ORMMA has implemented this API in an open source manner for iOS and Android to help various ad serving vendors and publishers see a working example of a compliant SDK. ORMMA will continue to maintain and build on this reference code to keep it up to date with the MRAID standard. Likewise, the ORMMA members will continue to contribute to the IAB to ensure the MRAID API remains a viable, rich feature set for all major mobile platforms. The ORMMA.org authors are encouraged by how their initial work is smoothly and quickly evolving towards an IAB supported standard. For companies who now are using ORMMA code, their continuity is ensured. If you have questions about how ORMMA relates to IAB and MRAID, feel free to contact us. 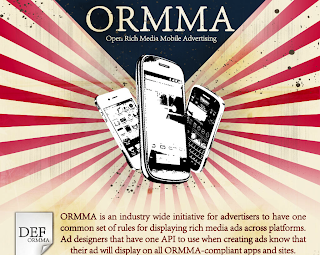 ORMMA, the first standard for mobile rich media advertising, is gaining broad adoption by major publishers, industry associations, and ad technology companies. We are pleased to announce that Crisp, a rich media technology company, now fully supports ORMMA’s in-app ad creative API (Level 1&2) via its Crisp Engage web-based tools. The Crisp Engage platform, currently in limited beta, provides partners with self-service access to its HTML5 based ad unit technology and the accompanying online management tools and dashboard. While it is common for rich media vendors to provide various productivity enhancing online tools to agencies or creative designers, Crisp is now doing so while also supporting this standard. An ORMMA web tester is integrated in the tool to give the users the ability to verify that the ad units are compatible with the in-app ad creative API - standardized by ORMMA. This gives the charter program members of the Crisp Engage program the ability to create, manage and share rich media ad tags, which are compatible with both web sites and mobile applications. 4. see the ad run in Android apps, iOS apps, tablet web and mobile web ? Yes. Without ORMMA this would not have been possible. Due to the incompatibilities between proprietary ad SDKs and the rich media ad units created by various tools, a standard API for ad creators was necessary. Crisp hopes that the Crisp Engage system will be just one of many to support the ORMMA standard.